How much are you polluting your immediate environment? We all breathe the same air and at present, the air quality in Delhi & NCR is pretty poor. Now that it’s Air Quality Awareness Week, here are 7 easy ways to cut the pollution your life produces and improve the quality of the air you breathe. We all know our cars contribute to air pollution, but did you know that every time you turn on a light, vacuum the house, or put a soda can in the garbage, you’re also causing pollution? 1. Use compact fluorescent lights: They use less electricity than incandescent bulbs. About 40% of the electricity we use comes from coal-burning power plants. 2. Vacuum your house only when required: Sweeping and mopping the floor every day is adequate to keep the house clean – there is no need to vacuum every day! Not only does it consume a lot of electricity, it also means you are burning energy and thereby creating more air pollution. Your power lawn mower running for an hour produces as much pollution as six to ten cars. 3. Use a push lawn mower: Your power lawn mower running for an hour produces as much pollution as six to ten cars. If your lawn makes using a push mower impractical, keep your mower in tune and be super careful when you put gasoline in your mower. Even small spills evaporate and pollute the air. 4. Carefully store household paints, solvents, and pesticides: Use airtight containers, and dispose of them properly when you’re done with them. 5. 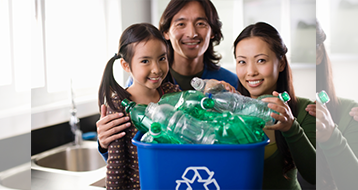 Recycle and reuse: Recycle paper, plastic, glass bottles, cardboard, and aluminum cans, and reuse salvaged building materials to conserve energy and reduce product emissions. 6. Use low-VOC (volatile organic compounds) paints: Or zero-VOC paint, if possible. VOCs are solvents that get released into the air as the paint dries. You can expect to see more brands touting their virtuous VOC content. Make sure to paint with a brush, rather than a sprayer. Better yet, reduce your use of all VOC products in your home. 7. Maintain your fireplace and chimney: A well-maintained fireplace or wood stove will burn more efficiently and keep furnace-fueled heat from escaping your home, as well as cutting down on soot and smoke.